Welcome to the Door County summer season! It is time to saddle up on your fold-out beach chair and enjoy the serenity of Door County. Step One: get set up at your favorite Ephraim resort, Ephraim Shores! Located just forty minutes north of Sturgeon Bay, in the heart of Door County, Ephraim, Wisconsin is the embodiment of scenic beauty. Ephraim Shores Resort & Restaurant is the perfect home base for summer Door County adventures. A hop away from Baileys Harbor, a skip away from Sister Bay, and a jump away from Fish Creek, Ephraim Shores gives you almost too many options for your summer vacation. The resort features ten room types with access to an exercise room, indoor pool, and in-room WiFi, in addition to beachfront property with a sundeck and free bicycle rental to explore the area. Ephraim Shores also throws its hat into the ring of local cuisine with the Second Story Restaurant. Sporting a fresh and locally-sourced menu, the Second Story Restaurant is located on-site for those early breakfasts and dinners. Book your room at this Ephraim resort now to ensure your slice of a Door County summer. Being right in the center of so many great Door County attractions, Ephraim Shores Resort & Restaurant gives you countless options around the peninsula. Ephraim Shores knows planning your trip can be a hassle. Here are a few attractions in Ephraim to slot in to your itinerary. Art is a big part of the Door County culture, especially local art. The Francis Hardy Center for the Arts (The Hardy Gallery) showcases exhibits from local and regional artists. Right on the shore of Eagle Harbor in Ephraim, Wisconsin, The Hardy Gallery hosts the Community Mosaic Project: a display constructed of 300 individual works submitted by community members. In June, the Annual Juried Exhibit is back for its 53rd year. The exhibit features paintings, drawings, photography, mixed media and more from local and regional artists. The exhibit runs from June 5 to July 12 and is just blocks away from Ephraim Shores. 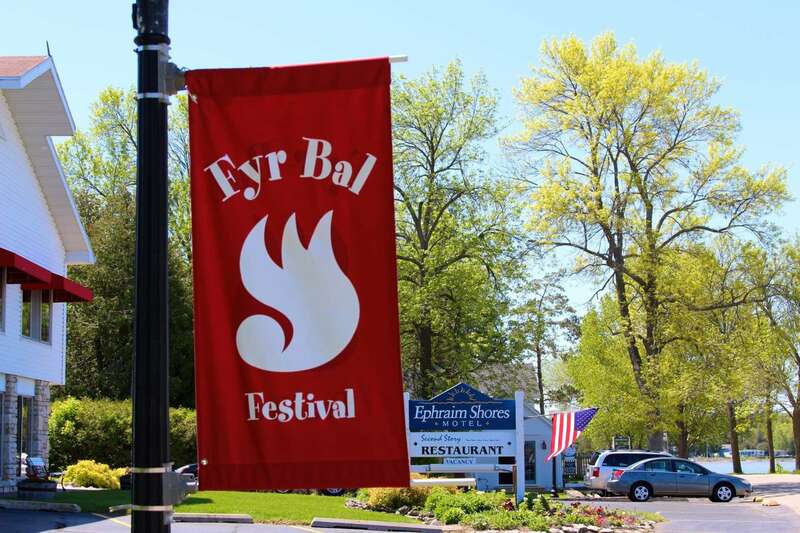 Ephraim explodes with summer excitement as Fyr Bal Festival (pronounced feer ball) re-creates traditions of early Norwegians celebrating Midsummer’s Eve. On Saturday, June 20th, Artists, food, musical entertainment and family activities along the picturesque shoreline of Eagle Harbor welcome the arrival of summer. Hop on the trolley or stroll through the village and visit the many historic landmarks, shops, galleries and restaurants for which Ephraim is well-known. A warm Scandinavian welcome awaits you in Ephraim during Fyr Bal Festival. Evenings in Ephraim are back! The 2015 concert series runs Monday nights from June 22 to August 31. Every Monday from 6 to 8PM, the Harborside Park gazebo plays host to live, local music. Grab your folding chairs and picnic blankets and enjoy some live music while watching the Ephraim sunset. The 2015 season starts on June 22nd with folk/rock singer Seth Raddatz. As you can see, Ephraim is home to a myriad of attractions. Host to Eagle Harbor and Peninsula State Park, Ephraim, Wisconsin is home to the Peninsula State Golf Course, Ephraim Kayak Center, the Ephraim Historical Foundation and the Ephraim Yacht Club. Book a day of your stay to experience the 18 holes of the Peninsula State Golf Course. Since it began in 1917, this golf course allows you to relax amidst the majesty of the forest. The Niagara Escarpment, a 1000-mile long cliff that spans from Wisconsin, through Canada and into New Hampshire, also adds to the scenery. Take the family kayaking! Kayak rentals, lessons and even tours of the Door County shoreline are all available. This activity allows you to enjoy the views Door County offers while showing the little ones the joys of kayaking. Start your marine adventure at the South Shore Pier located just South of Ephraim Shores on Water Street. A trip to your Ephraim resort is not complete without experiencing some of the countless dining options. You have unique and unmissable options from the fish boils at the Old Post Office Restaurant to Wilson’s signature ice cream. Don’t forget about Ephraim Shores’ own Second Story restaurant. There are enough establishments in Ephraim to keep you filled and satisfied for your entire stay. Ephraim Shores Resort & Restaurant is open from May to mid October. From the calming beaches to the changing leaves, each season has its own perks for a visit. An every-season perk of Ephraim Shores, though, is the bicycles they provide free of charge so you can experience the town and surroundings without cutting yourself off from nature. Ephraim Shores is a splendid family getaway for lodging on the waterfront. Room rates start at $99. Get in touch with Ephraim Shores, and book a room by calling 920-854-2371, 877-854-2371, or by email at [email protected].